While others are worrying that new physics might be running out of corners (see Eve Le Ménédeu's blog) we should not forget that even within the book of the Standard Model there are completely unread chapters. The Standard Model draws its success from the fascinating fact that its basic energy density formula, called Lagrangian, is uniquely defined by just specifying three fundamental symmetries. It not only fits on John Ellis's t-shirt (see blog by Jessica Levêque) but even on a mug in Figure 1. Introducing a spin zero Brout-Englert-Higgs field by adding the last two lines on the mug allows for a symmetry-breaking ground state, gives particles their mass and us the chance to live on earth and investigate all this. 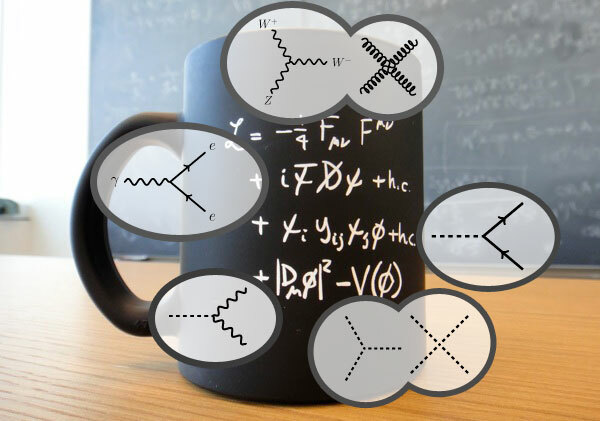 Each term on the mug corresponds to a chapter in the Book of the Standard Model by describing a certain class of processes via vertices in Feynman diagrams. For thousands of years mankind has been reading Chapter 2 (second line), describing the interaction of 'Gauge particles' like photons, which mediate forces, with 'matter particles' like electrons, laying the basis for forming atoms, molecules and matter. Chapter 3 (third line) and Chapter 4a (4th line left) with the Higgs couplings to fermions, like top and tau, and to bosons, like W and Z, was opened only in 2012 at CERN's LHC and currently thousands of scientists are reading it with increasing passion and excitement. For the right-hand part of line 4, the Higgs self-coupling chapter, we will have to wait for the next generation of accelerators. But what about Chapter 1 in the first line? Its lowest order content, the free propagation of photons, is not even depicted in the figure. Classically, this free propagation was described as electromagnetic waves, predicted and found by Maxwell and Hertz in the second half of the 19th century. Depicted near the mug are self-interactions, which only exist for those gauge particles, who themselves carry the charge of the interaction, i.e. for the strong gluons and the weak W and Z Bosons. The existence and predicted strengths of all so-called 'Triple Gauge Couplings' (TGC) of three gauge particles have been proven at LEP (1992 for gluons and 1997 for W and Z Bosons). However, the so-called 'Quartic Gauge Coupling' (QGC) of four gauge particles – for gluons at least indirectly seen - was never part of any measured process involving W and Z bosons so far. It thus remained a completely unread section in Chapter 1 of the Book of the Standard Model -- until this week! Last Thursday, the ATLAS collaboration at CERN announced the first observation of a process which involves the quartic gauge coupling: the scattering WW → WW of two W bosons with same electric charge. In two simultaneous conferences -- Marc-Andre Pleier's talk in Moriond's morning session, and Anja Vest's and Ulrike Schnoor's talks in the afternoon sessions of the German Physical Society Spring Conference -- the community had the chance to witness the opening of this thus-far-unread section of the Standard Model. In addition to 16 expected background events, ATLAS observes an excess of 18 candidate events for WW → WW scattering, in perfect agreement with the Standard Model, predicting 14 such signal events in the 8 TeV LHC data. The probability that the background could have fluctuated up that far is only 1:3000. But how can two W Bosons scatter at LHC, when in fact protons are collided in the first place? Quite frequently, in such a collision, a quark inside a proton radiates a W boson. Less frequently, this happens in both of the colliding protons, so that the decay products of two Ws will be visible in the detector. In very rare cases, before their decay, these Ws can come close enough to scatter via the electroweak force. A candidate for such a scattering event is shown in the figure: It has the characteristic features of two 'tagging' jets close to the beam axis, produced by the two radiating quarks, large missing transverse momentum from the neutrinos (blue arrow) and two like-sign electrically charged leptons (red towers) from the W decays in the central part of the detector. Observing this process first for like-sign Ws was not accidental: W pairs with the same electric charge have the huge advantage of negligible background from top-antitop decays or W radiation from gluon-induced quark-antiquark pairs, which can only produce W pairs with opposite electric charge. Actually, this scattering process of gauge particles is at the heart of electroweak symmetry breaking, mentioned in the beginning, and was one of the key reasons to build the LHC. In the Standard Model, the contribution of Higgs Bosons is needed to make sure that the rate of this scattering for large WW centre of mass energies in the TeV range obeys the basic 'unitarity' law, that a probability cannot be larger than 100%. These critical energies will indeed be reached in the forthcoming 13 TeV run. The scattering of gauge particles will then tell us more about the properties of the Higgs Boson and the symmetry-breaking Brout-Englert-Higgs field. Maybe we don't have to look too far to find remote corners; perhaps new physics is written in this quartic gauge coupling section of the book of the Standard Model, a chapter we have just started to read. Michael Kobel is a full professor at TU Dresden and is currently head of the Institute for Particle Physics and Dean of Studies in the Dept. of Physics. He is a member of the ATLAS Collaboration at CERN, having worked before in six high energy physics experiments at four laboratories. Since 2005 he has been project leader of IPPOG’s “International Masterclasses” and project leader of the German “Netzwerk Teilchenwelt” since 2010, two initiatives bringing basic science to the public.